In honor of this year's theme for Entrees & Insights, "A Celebration of the Arts," join us for a community celebration of Shabbat. 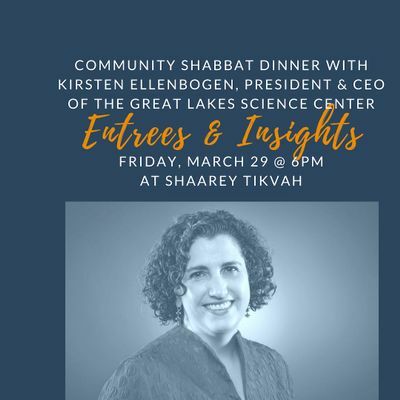 Services begin at 6pm (free and open to the public), followed by a catered Shabbat dinner and engaging presentation by Kirsten Ellenbogen, President and CEO of the Great Lakes Science Center. Kirsten will talk about her vision for the museum, STEM education, and what it's like to be at the helm of one of Cleveland's most well-regarded cultural institutions. 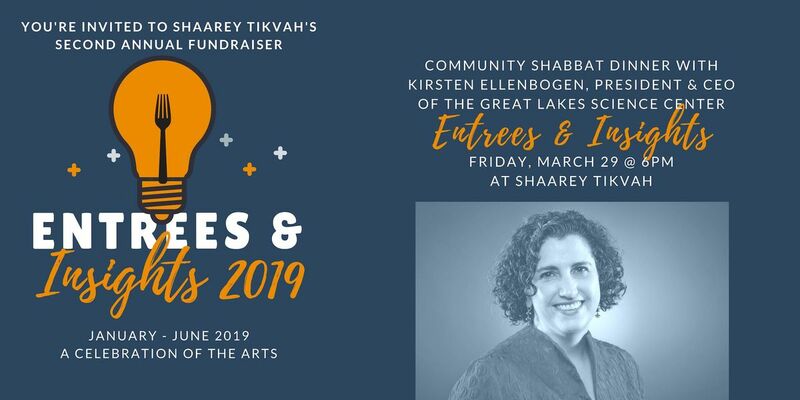 This event is a part of Entrees & Insights, a series of exciting, engaging dinners to support Congregation Shaarey Tikvah. Everyone is welcome, regardless of affiliation with the synagogue or Jewish community. Kashrut for this event will be provided under the supervision of Rabbi Scott Roland.